LG may be determined enough to deliver a truly bendable smartphone before Samsung that it's reportedly contorting its next-generation LG G Flex to be flexible up to 90 degrees. 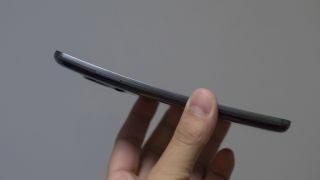 The right-angle LG Flex 2 is said to be "bendable with force," according to ZDNet Korea, making it sound as if it'll fall in between today's curved phone and foldable technology of the future. Curved phones currently on the international market include the LG G Flex and the Samsung Galaxy Round. Neither have made it out of Asia just yet. The usefulness of these large, bendable phablets isn't readily apparent, but both LG and Samsung have been known to throw prototype-like devices out on the open market with or without commercial viability. Samsung has long experimented with flexible displays, but the next-generation LG G Flex may make the first fold. The unconfirmed LG G Flex 2 is reportedly being planned by the South Korean manufacturer for debut next year. There are other components the two companies are racing to contort, including batteries. LG Chem, for example, invented a battery in the form of a cable that won't heat up - even when it's tied into a knot. However, there are no rumors attached to ZDNet Korea's report that indicate a flexible battery like this. So far, the LG G Flex and Samsung Galaxy Round aren't available worldwide. Even if LG and Samsung decide to pursue bendable technology, we may never see it released outside of their home territory. Story arc: LG G Flex headed outside South Korea soon.